As Leo Baeck Institute presented the 2010 Leo Baeck Medal to Maestro Kurt Masur, who left such an enduring imprint on cultural and political life in both Leipzig and New York, it was fitting to shine a light on the generation of German and Austrian musicians before him that blazed a parallel trail across the Atlantic and transformed musical culture in America. 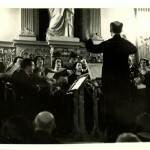 The work of this émigré generation has left a deeply interconnected web of traces in the archives of Leo Baeck Institute that bears investigation for anyone interested in the history of modern music. Unlike Masur, who came to New York freely after playing a pivotal role in the peaceful dissolution of the dictatorship in East Germany, the earlier émigrés came to the United States in most instances because they had been banned from practicing their art freely in Germany. 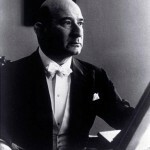 The more famous among them, such as Klemperer and Schoenberg, left Germany as soon as the Nazis seized power and quickly found homes at American institutions. Those who remained longer were subjected to increasingly circumscribed professional and artistic possibilities. The Nazi regime eventually forced them to perform a segregated repertoire in segregated institutions for segregated audiences – and then not at all. The LBI archives contain a wealth of materials related to the Jüdischer Kulturbund, an organization established to benefit Jewish artists that became the only legal employer for Jewish performers after 1933. These documents demonstrate a process in which artists that had begun their careers in the mainstream of German modernism were forced to conform to an increasingly narrowly defined Jewish artistic identity. They also happen to document the extraordinary creative work of a community that included many of Germany’s foremost musicians. In many instances, the creative alliances forged through the Kulturbund were continued in the United States, and these partnerships have left traces in the archives as well. 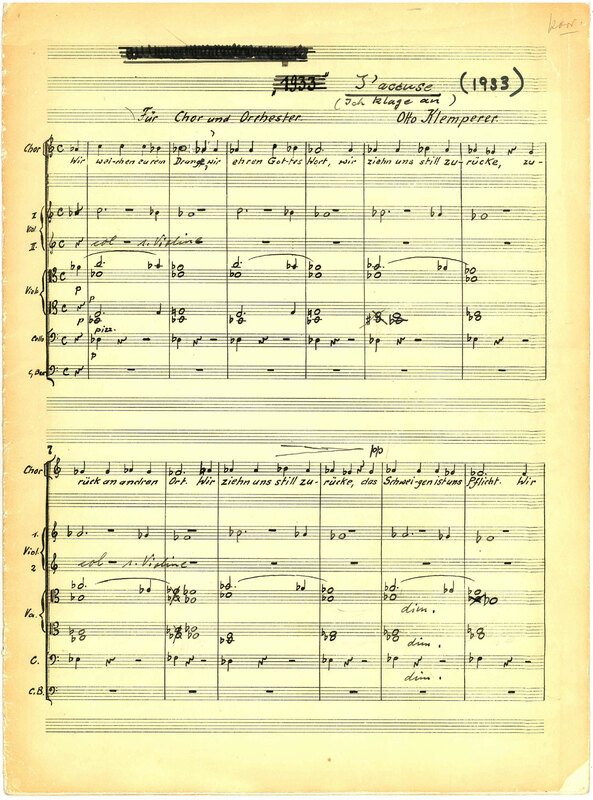 Taken together, the letters, contracts, concert programs, clippings, photographs, manuscripts scores, and audio recordings preserved in Leo Baeck Archives make up a fascinating collage in which we can recognize the outlines of a shift in the center of gravity of musical modernism from Europe to America. The following pages contain just a handful of representative cases. 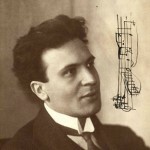 Bruno Walter’s career spanned nearly seven decades on both sides of the Atlantic and provided the blueprint for the role of the conductor as an interpreter of music. 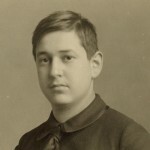 Starting with his mentor Gustav Mahler’s late works, Walter left an enduring stamp on the way that works by Mozart, Wagner, and other composers are performed. 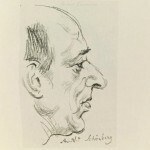 Arnold Schoenberg is recognized as one of the most important composers of the 20th century, and he appears again and again as a correspondent and topic of discussion in the papers of prominent musicians in the LBI archives. 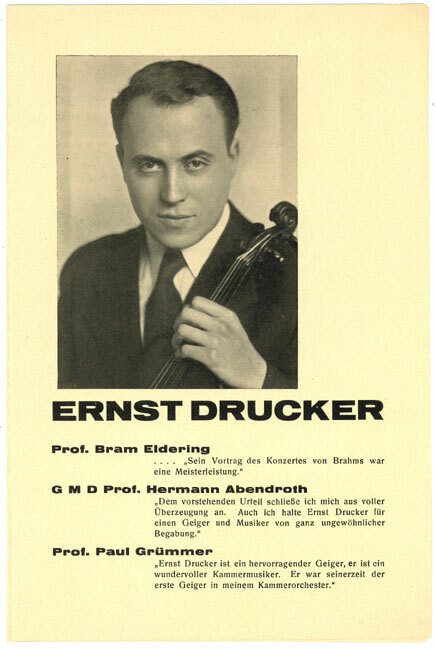 Violinist Ernest (Ernst) Drucker’s papers in the LBI archives reflect the rich pool of talent associated with the Jüdischer Kulturbund during the 1930’s. 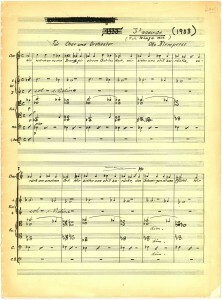 Unlike many artists of his generation, whose careers were completely derailed by oppression and exile, Drucker was able to continue a successful career in America. 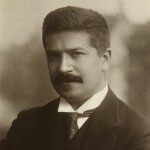 Known more for his communicative and emotional playing than technical mastery, Artur Schnabel eventually made recordings of all 32 Beethoven piano Sonatas which are still prized for their musicality despite inaccuracies. As a composer, he embraced a much more modern aesthetic.